Our guest is Meagen Eisenberg. We’ve been featuring guest experts on the sales side, so finally we’re going to spend a little time in the next couple episodes on the marketing side of the business and talk particularly to marketers that are embracing revenue responsibility, that are taking advantage of the opportunity from a cost center into a profit center. 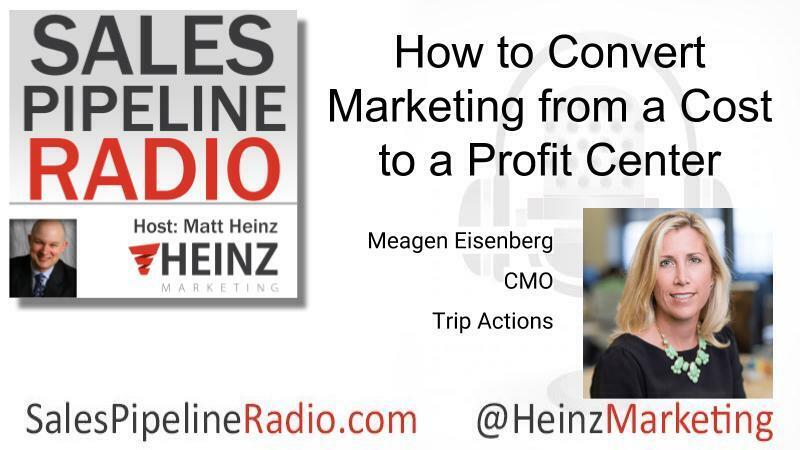 It’s important in B2B marketing these days to make sure that what you’re doing is driving to business results, and I can’t think of a better person to feature than Meagen. Meagen brings more than 19 years of experience in the high-tech industry to her role at TripActions. She has been recognized as one of the Top 50 most retweeted by mid-sized marketers according to AdWeek and one of the Top 25 B2B Marketing Influencers according to InsideView. In 2014, she won the Marketers that Matter award. Additionally, she won the SuperNova Award in Matrix Commerce from Constellation Research in 2012 and the Marketing Visionary Markie award within the marketing automation field in 2011. Meagen advises for several tech startups and before joining MongoDB, she was the Vice President of Customer Marketing and Demand Generation at DocuSign. She also held previous positions with ArcSight, an HP Company, TRIRIGA (acquired by IBM), Postini (acquired by Google) and IBM. Meagen has an MBA with a focus on marketing and strategy from Yale School of Management and holds a B.S. in MIS with a minor in CSC from California Polytechnic University at San Luis Obispo.